A great home with a complimentary golf cart for 4-5 families with children or up to 14 adults max. Spend an unforgettable vacation in this beautiful cottage-style home very close to the beach. 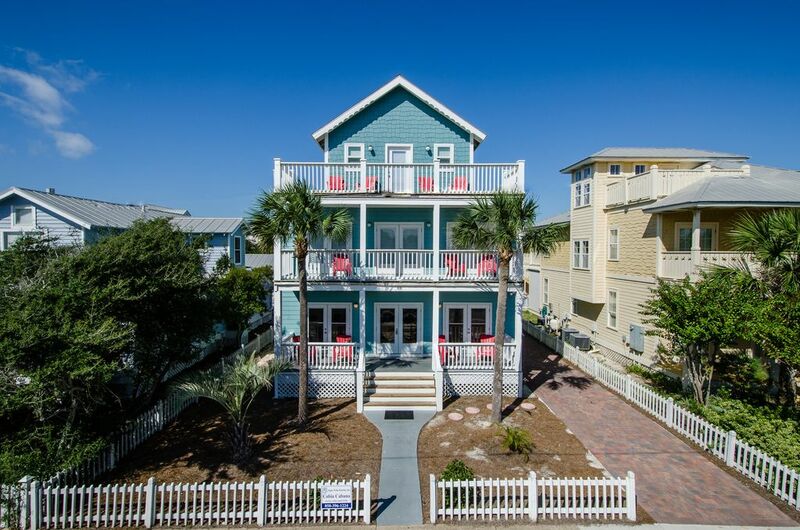 The home is like new – with interior updates and modern conveniences – and it still has that special charm and comfort you expect from a classic beach home. The well-planned layout of this home can comfortably accommodate up to 14 adults, or 4-5 families with children. It features 6 BEDROOMS and 5-½ BATHROOMS, including 3 King Masters, 1 Queen Master, 1 Triple Queen Bedroom and a Bunk Room with full-over-full bunks (2 full-size beds). You’ll enjoy nice ocean views from the 2nd & 3rd floor balconies. There is plenty of room for everyone to gather in the spacious living area and the incredible custom kitchen is open to the action as well. The private pool is surrounded by new brick pavers. And when you’re ready for the beach – it’s a very short walk – less than a block away! For the convenience of our guests, we have also included a full-size washer and dryer, an iron, ironing board, broom, and a few cleaning supplies. We keep our home clean and well updated, and pay attention to amenities you expect, such as high-speed wireless internet (free wifi), nice flat-screen TVs, high-definition cable, hair dryers in each bathroom, and more. We also provide items our smaller guests may need like a high chair and pack-n-play. The complimentary 4-PASSENGER GOLF CART makes it easy to get around the Crystal Beach area. The expansive front porch welcomes you into this exceptional home. Inside, you’ll find a bright and beautiful living area with gleaming hardwood floors, custom wainscoting and brand new furniture that provides plenty of seating for your entire group. There’s also an extra-large HDTV. The wide open spaces continue in the chef’s kitchen with incredible tile floors, custom cabinets and granite counters, and new stainless appliances (including an extra-large refrigerator with 2 ice-makers). The beautiful beadboard ceiling is another example of the creative details added to this home. A stunning granite island/bar wraps around the kitchen and is open to the living area with 5 barstools, There’s also a kitchen breakfast area (with seating for 4) with a nice view of the pool. You’ll find all the dishes, pans and utensils you may need, a Keurig D-Cup coffee maker, as well as a regular drip coffee maker, a toaster, blender, crock pot and even a few spices, to get you started. The beautiful, open dining area has a large table with seating for 10. This lovely room on the 1st floor of the main house features a QUEEN BED with a wicker headboard, beautiful wood floors, a new quilt and linens, 2 side tables with lamps, and a flat screen TV with DVD player. There is also a convenient walk-in closet and a private ensuite bathroom. This private bathroom features a vanity with sink, commode and a tub/shower combination. You’ll find big, fluffy bath towels and a personal hair dryer here too. This is a half bath near the front door which is convenient for all guests. It features a vanity with sink and a commode. This spacious master bedroom features a KING BED, wood floors & custom wainscotting, and 2 french doors opening to huge balcony with ocean views. There are 2 twin sleeper chairs (perfect when you want your children to share your room), and a flat-screen HDTV. You’ll find a large closet and convenient full-size washer and dryer on the way to the ensuite bathroom. This spacious bathroom features a large vanity with two sinks, a commode, and a beautiful tile and glass shower. This inviting bedroom is full of light and features a KING BED, wood floors, a beautiful wood headboard and access to the large front balcony with ocean views. You’ll also find a bedside table with reading lamp, a dresser and a large closet. This room shares the full bathroom with the bunk room on this floor. A great room for children - this room has a full-over-full bunk bed (that’s 2 full-size beds), a nice closet and an attached Jack-and-Jill full bathroom. Bathroom #4: This full bathroom opens to the hallway and to the bunk room. It features a nice vanity with sink, commode and a tile tub/shower combination. Children, teens, and even adults love this extra large private space with 3 QUEEN BEDS, beautiful wood floors, and windows throughout. There’s a dresser, bedside tables with lamps and a flat screen TV with DVD player, as well as a great seating area with two sofas - a perfect spot to gather for indoor fun. This space has it’s own Mitsubishi air conditioning unit with remote control - so you’ll be comfortable all of the time. Perhaps, best of all, this room opens to an amazing 3rd floor wrap-around balcony with great views! This full bathroom features a vanity with sink, commode and tub/shower combination. You’ll also find big fluffy bath towels and a personal hair dryer. The 12’ x 27’’ private pool is surrounded by brand new brick pavers, giving you space to enjoy the Destin sunshine. You can relax in the 3 new lounge chairs or enjoy some shade under the umbrellas at the two tables with 8 chairs. For outdoor cooking, there’s a large, natural gas grill (no running out of propane in the middle of cooking). And for your children’s safety, there are alarms on the doors leading to the pool from the main house and the Carriage House. Pool heat is available for an additional fee. Another favorite feature of this home is the private basketball court behind the Carriage House. It has an adjustable height goal and the basketball is provided. This lovely Carriage House is next to the private pool behind the main house. Inside you’ll find a comfortable living area with a queen sleeper sofa, chairs and a flat screen TV. Included in this space is a kitchenette with a full-size refrigerator with ice-maker, double sinks, drip coffee maker & microwave. There is also a washer/dryer combination appliance in the carriage house to supplement the ones in the main house. A small table and chairs make a great spot for morning coffee or a snack. There’s also a King bedroom and full bathroom in this extra house, and you can just step outside to enjoy the pool! This beautiful, bright bedroom features a comfortable KING BED and a large nightstand with reading lamp. You’ll have plenty of space to settle in and enjoy the wall-mounted flat screen TV with DVD player. This cheery bathroom includes a commode, sink and tub/shower combination. There’s also extra hanging storage space in this room. This bathroom is nice for guests sleeping in the Carriage House, and also very convenient when you’re spending time out by the pool. You’ll also find a personal hair dryer and big fluffy bath towels in this bathroom. The house is very close to the beach - it’s about one block to either the Pompano Street or Baracuda Street beach access. We provide a cart with beach chairs and an umbrella, so you can roll your gear to the beach with ease. This home has a large driveway which accommodates 4-6 vehicles (depending on the size of the cars.) There is no on-street parking allowed in Destin. We are pet friendly and welcome your dogs in our home. Pre-approval and a $200 + tax pet fee apply..
just 1/2 a block from the beach! We do not provide beach towels. We provide basic spices, tin foil, plastic wrap, and starter paper products. 10 at dining table, 6 at counter bar, and 4 more at kitchen table - larger families can eat together! Multiple televisions, Blu-ray and DVD players throughout the home, HD service on several. Lots of decks & balconies! We enjoyed our stay in the home with 4 families represented. The basketball court was a hit with all of the kids in our group. We appreciated the beach chairs available for use as well as the many extras in the kitchen. We did have a couple if issues with the pool alarm, upstairs air conditioning, and a leaky roof but the rental company was very responsive. The pool was enjoyed and the heat was totally worth the extra cost. Thank you for working to make our stay a positive experience! Thanks for your kind review of our home and our service despite the triple whammy you experienced while when staying in our property. This is the best compliment we can get (when things go wrong but our guests are still very happy!) While we try very hard to make sure every one of our homes is in perfect condition when you arrive, sometimes things out of our preventive control happen during your stay. But rest assured we're right here to rectify and and all issues in an expedient manner. To explain the issues and quell fears if you're thinking about booking this home, here are the issues these guests had, and the resolutions taken: The AC on the 3rd floor stopped working. We brought over window AC units to get them through the night and were able to get the AC repaired the next morning (it was a blown capacitor). The pool alarm was acting irrationally (not turning off properly) once we changed the batteries it was rectified. The roof leak was discovered when we had torrential downpour rains. There was a piece of flashing near the chimney that had come off, we replaced the flashing and fingers crossed it is fixed for good but with roof leaks we're never fully confident until the next big rain comes and we can double check. Cobia Cabana was an amazing property for our Spring Break! There was plenty of room and privacy for 6 adults and 8 teenagers. The rental staff was exceptionally attentive and the home was clean, attractive and well maintained. The pool (heated) was the perfect size for our group; a plus for volleyball net! Additionally, the beach chairs, golf cart and wagon were a welcome convenience. Most importantly, was the proximity to the BEACH! I would surely stay at this property again! Overall the house exceeded expectations, they did a great job welcoming us and the house was perfect for our family! Thank you very much for a great week! We're so pleased to hear that you enjoyed your stay! Thanks for your comments, Dove. In all my time working for Sugar Palm I have never experienced a red tide OR a mandatory evacuation - it was unfortunate for the vacationers in the area who happened to be affected by both. These were extraordinary circumstances that were out of our control and I'm disappointed too that your vacation was interrupted. The good news here is that the safety precautions worked as they should - all of our guests and employees were safe and many of our guests returned to their vacations as soon as the storm passed. Destin was spared from any storm damage, the sun is out and it is back to business as usual! We're glad that you got to experience our home Cobia Cabana first-hand and enjoy how cheerfully decorated and sparkling clean it is - you can always expect the same from every Sugar Palm property! We hope you'll stay with us again sometime under better circumstances. A quick walk to the beach, great pool and plenty of room to enjoy each other’s company. We're glad to hear that your family enjoyed your stay at Cobia Cabana, Danielle. Next time you stay we would love to hear how we can earn that fifth star... Our Guest Services team is available 24/7 and eager to exceed your expectations! This was our first full family trip ( 18 people). The house looks just like the pictures shown, down to the red Adirondack chairs on the 3 porches. The kitchen is large enough for several people to be cooking at one time. The bedrooms were spacious and the pool was great!!! The beach is less than a block away. I can't stop telling people about the house and Destin, FL. Destin is definitely family friendly. Would definitely rent this house again. No major issues, just needed a mop and pool alarm battery replaced. When we called about them, both issues were handled within minutes. Thanks, Sherry for everything!!! Wow! Thank you so much for your nice words about our home!